Garmin Virb 360, the first 5.7K / 6K (5760 x 2880) stabilized 360 camera to reach the market, is now more affordable than ever at $699, $100 less than when it was first released at $799. There’s also a package that includes a waterproof remote for $720, which is up to $30 less than when purchasing the two separately. If you already have a Virb 360, you can purchase the remote separately for around $45 to $50. The Virb 360 has one of the best, if not the best, stabilization among 360 cameras, has a replaceable lens, and has a long list of features such as a 3.5K 60fps video mode, a travelapse, and the ability to remotely control more than one camera at the same time. See here for other cool features. 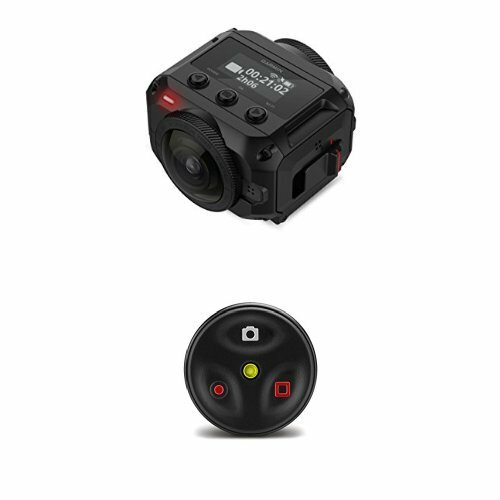 With the new lower price, the Virb 360 now has the same price as the GoPro Fusion with 5K / 5.2K (4996 x 2498). You can see how they compare against each other with the Ultimate 360 Camera Comparison page. Hey Mic. I need 360 camera for shooting videos and you know I read a lot on the subject, yet I need your advice. Yi 360, Fusion or Virb? Virb has been out for some time now so is the most reliable one. Replaceable lens is it’s enormous plus. Stitching is so-so, Mistika could solve it but it adds to the production costs. I’ve seen some example shots with significant lens flare. Yi is the most affordable one. Some members in Yi group on FB reported some issues that were eventually solved by replacing the unit. Since I am in Croatia, I am a bit affraid of this potential scenario. On the other side, people from Yi are very active in FB group so I guess we could solve any issues eventually. I have seen sample shots that were really impressive, yet some samples had not so impressive colors (for instance blue in the sky in your comparison tool). I believe Yi will constantly add new features and make it better and better, like Insta did with all their cameras (except for 4k beta). Fusion is, obviusly, the least finished product of the three. It feels rushed, people are reporting various problems. I guess GoPro will also succeed in developing normal product sometimes. It will get better. There are some sample shots that I actually love the most in terms of image quality and colors, compared to Virb and Yi. I will buy one of those three and I could wait for , eventually, two more months to see how things develop. What do you think? I don’t need camera for everyday use but for my artistic projects. Ps thanks for the glasses, received them few days ago. Hi Bruno. Out of those three, I like Fusion the best because of the dynamic range, which seems to be higher than either Virb or Yi 360 VR. I did some re-tests to confirm this but haven’t had time to download and analyze the results yet… so many things on my to do list… The downside is as you said it’s kind of rushed, so has some bugs, but i think those bugs will be resolved.